Finally, after years of study, development and manufacture of window frames always the best in terms of water resistance, more resistant to strong winds, the thermal resistance and the acoustic seal, comes a laying system in which each home or office, You may see improved their energy efficiency. Over the years they have come and gone tools, materials and installation methods different from each other (which does not mean that they were efficient but certainly less efficient than the new methods) to which today we can not in any way "to blame" for wrong mountings past, just because there was a study nor a method that was going to solve the problem of proper installation. But we can take stock of all that is information (new technologies, new methods, new meterial, etc ...) in order to give a better service every day. We could stand to explain to our customers the technology that lies within this system, but I think we risk doing only confusion. Therefore we ask you to visit the reference site www.posaclima.it to have all the technical information of this extraordinary system. One of our technicians will carry out a survey in order to have a clear view of what the customer wants. This will help us to make a first analysis of the initial situation of departure. After the inspection we're going to agree with the customer the type of intervention that will be done and we're going to do a cost estimate. Our company will realize the job with the right manner and within the time fixed in the estimate. Simply put this system will improve the energy efficiency of your pension. "Energy efficiency is the ratio of the results in terms of performance, service, goods or energy, to be understood as service provided, and an input of energy." Virtually improve energy efficiency means getting more performance with less energy used. WHY 'SPENDING / SAVE THIS SYSTEM ??? The question may be ambiguous, but believe me! And 'the question you should ask yourself! Because the answers we give them to you! In fact we all know that to make this work you have to SPEND money, but you also know that this intervention will bring economic benefits such as SAVE you a lot more than the initial expense! Not to mention the incentives of tax deduction for renovations and energy improvement. WHY 'SPENDING / SAVINGS TO REPLACE THE OLD WINDOW WITH A NEW OR IMPROVE ENERGY OF AN OLD WINDOW? The old frame (of course we talk about fixtures without a gasket or with a gasket and a mounting performed without tapes thermo expanding) it has a technology, both structural materials, old, outdated, and therefore poor. The frame and the installation system used previously brought a great energy loss at home. A new frame will improve thermal efficiency, acoustic and waterproofing! This is because with the latest generation technology and the finest quality materials. The Posaclima will bring a further improvement in energy efficiency and BASIC home by eliminating drafts (continuous exchange of air and moisture) and eliminating cold spots of the frame (elimination THERMAL BRIDGES) thanks to the use of products and materials that allow excellent excellent insulation. WHY 'INSULATE THE BOX of the roller ??? The container is not insulated brings a great and severe heat loss and noise because it is directly connected with the outside world and therefore plays a role THERMAL. 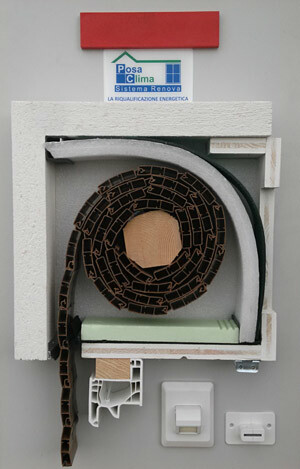 Coibentandolo there is an improvement up to 15% thermal and acoustic insulation up to 40dB !!! Our company has participated in and successfully completed the courses of learning and testing made available by the partner of choice who devised the system Posaclima and is able to offer this service with expertise, experience and professionalism.